Lions, Land and People in the Greater Kruger area. Restoring ecosystems and human value systems. 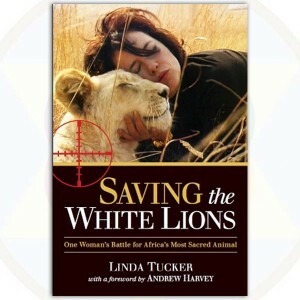 In this captivating, suspenseful memoir, white lion conservationist Linda Tucker describes her perilous struggle to protect the sacred white lion from the merciless and mafia-like trophy-hunting industry. The story begins with a heart-stopping vacation gone wrong: Tucker and her companions find themselves stranded on a dark night in the Timbavati bushveld, a pride of angry lions closing in. Miraculously, a local medicine woman appears, calming the lions and helping the group escape. Tucker's life-threatening experience becomes a life-changing one. She abandons her career in Europe and returns to South Africa to find the mysterious medicine woman, who reveals to Tucker her sacred destiny. Compellingly written in the intimate style of a journal, the book describes with unflinching honesty all of Tucker's hopes, fears and dreams; recounting an unforgettable tale of adventure, romance, spirituality and most of all, justice. LINDA TUCKER grew up in South Africa during Apartheid and attended the universities of Cape Town and Cambridge. In 2002, she founded the Global White Lion Protection Trust, an organization that works not only to protect the white lions but also to protect the communities and knowledge of the Tsonga and Sepedi cultures, which celebrate the white lion as a sacred living heritage. She has been a guest speaker at multiple international conservation congresses, and her work has been featured in documentaries produced by National Geographic and Animal Planet. She lives in the Timbavati reserve of South Africa with her partner, lion ecologist Jason Turner. Imprint: North Atlantic Books, U.S.